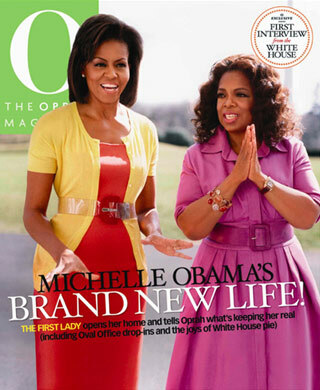 Michelle Obama appeared on the cover of O with Oprah Winfrey, in the April publication. Michelle wears Michael Kors, which marks her second big Kors moment of the week after she chose one of his dresses for her official White House portrait. 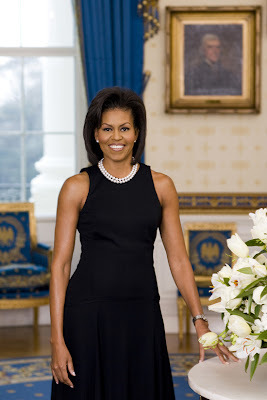 Here is Michelle Obama’s official First Lady Portrait. She is wearing a stunning black Michael Kors dress. A graduate from Parsons School of Design, Tracy Reese has become a fabulous designer. She ranks as one of the fashion industry’s most successful African-American woman designer whose realm is not relegated to the runway. Tracy Reese has two clothing lines, Plenty and TR, which have been sold at Bloomingdale’s, Saks Fifth Avenue, and many other top retailers since the mid-1990s. Her company’s sales topped $12 million in 2003, and it launched a Plenty-label home line that same year and a footwear collection the following year. She has a great eye for what women will buy. “I don’t want to design a skirt just because a skirt is needed to go with a particular jacket,” she told Essence. “The skirt itself has to make you want to buy it. Minutes before Jason Wu was to become famous as the 26-year-old designer of Michelle Obama’s inaugural gown, he ordered a pepperoni and mushroom pizza from Domino’s at his apartment in Midtown, then sat down with his boyfriend and a neighbor to watch the festivities on television. Like the rest of the world, Mr. Wu had no idea what the new first lady would wear on Tuesday night. He had never met her, nor did he know that the design he had submitted to Mrs. Obama, last November, was being seriously considered. At first he wasn’t even positive that the white chiffon dress she wore, which went by in a blur, was his until the phone began ringing and ringing and ringing. In his small studio on West 37th Street, Mr. Wu, with close-cropped hair and a lineless face, wore a cardigan and a necktie and looked like a truant from boarding school. His work space is spotless, with a big rustic slab of wood as a table, which is precisely where the thousands of organza flowers and crystals had been hand-sewn to Mrs. Obama’s dress over many late nights by Mr. Wu and his staff of four. Between interviews, Mr. Wu was working on samples for his fall collection, which will be shown next month. Although he was already something of a “fashion darling” — Anna Wintour attended his last show, when he was a finalist for Vogue’s annual prizes for emerging designers — he is expecting a crush of new attention. On Wednesday, Diane Von Furstenberg sent him a congratulatory note, and Parsons the New School for Design issued a press release boasting that Mr. Wu, Isabel Toledo and Narciso Rodriguez, all designers of clothes worn by Mrs. Obama last week, had once studied there (though it did not note that none of them graduated). “No doubt, this is going to give the business a boost,” he said. Mr. Wu started the label in 2006 with money from his family and his savings from a job he has held since he was 16, as a freelance designer, and now creative director, for a line of designer dolls called Fashion Royalty and manufactured by Integrity Toys in Chesapeake City, Md. His dolls ($70 to $400) are sold at F. A. O. Schwarz. His evening dresses ($2,990 to $4,700) are sold at Bergdorf Goodman. The word “prodigy” comes to mind when Mr. Wu mentions that his collection is expected to have sales of $4 million this year. Even when he was 5, growing up in Taipei, Taiwan, his parents, who operate an import-export business, recognized his creative ambitions. His mother sometimes drove him to bridal stores so he could make sketches of the gowns in the windows. When he was 9, the family moved to Vancouver, British Columbia, where, like many future designers, he began experimenting with fashion by using dolls as mannequins. He carried on with his hobby as a student at Eaglebrook School in Deerfield, Mass., and at the prep school Loomis Chaffee in Windsor, Conn., during a senior year in France and then for three-and-a-half years at Parsons until he left to intern for Mr. Rodriguez. Mr. Wu’s clothes are most often described as ladylike and seem to belong to an earlier era, meaning polished jackets, flower prints and dresses with nipped waists and teacup skirts. He spends a lot of time at stores around the country, at Satine in Los Angeles, Jeffrey in Atlanta and Ikram in Chicago, developing ideas for specific customers and climates. It was Ikram Goldman, who has played a behind-the-scenes role in connecting designers with the first lady, who introduced Mr. Wu’s designs to Mrs. Obama. (She had previously worn one of his dresses for an interview with Barbara Walters; she bought it at cost — for a little less than $1,000 — through Ikram, he said.) After the election, Mr. Wu immediately sent sketches to Ms. Goldman. Two days later, Mr. Wu recalled, Ms. Goldman asked him to make the white dress. It was ready by Thanksgiving, when Mr. Wu, who is 5-foot-7, flew to Chicago, carrying the floor-length gown in a garment bag on his lap and hand-delivered it to Ms. Goldman. He was not paid for that dress or two more colorful designs he submitted later, he said, but made them with the understanding that if Mrs. Obama should end up wearing one, the dress would be donated to the Smithsonian Institution. “It’s priceless to be a part of history,” Mr. Wu said. The symbolism of Mrs. Obama’s choice of such a young American designer is invigorating for the fashion industry, especially at a moment when new companies are facing tight odds of survival. First Lady Michelle Obama picked fashion insider Isabel Toledo, 47, to design her Inaugural ensemble. The glamorous, creamy yellow dress and matching overcoat were made of satin-backed wool guipure, a kind of lace used most often in French haute couture. Obama accessorized the look with a sparkling crystal necklace and green leather gloves and shoes. Although the First Lady’s office repeatedly said that Obama would not decide on her outfit until that morning, the choice — including the color, fabric and accessories — shows a lot of confidence and planning on the wearer’s part. She celebrated her husband’s inauguration on that night wearing a white chiffon, one-shoulder gown covered in fluffy appliques and beading that will now become part of fashion history. Designed by 26-year-old Jason Wu, much loved in the fashion world but otherwise not well known, the gathered-skirt gown was surprising for its reserve given Michelle Obama’s love of jewel tones and sleek silhouettes. The gown’s slight train swirled pleasingly and her shoulder-sweeping earrings picked up the gown’s sparkle as she and President Barack Obama danced the evening’s first dance at the Neighborhood Ball at Washington’s Convention Center.